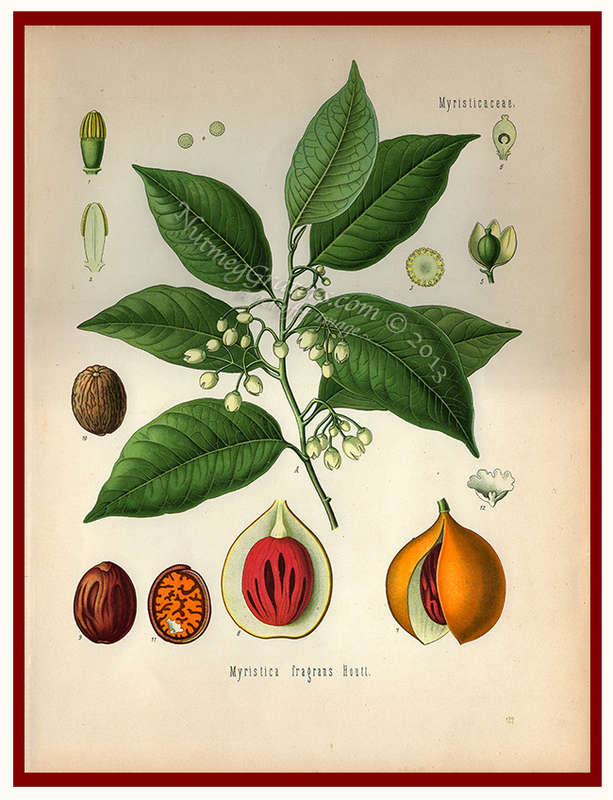 PRINT ENTITLED: Myristica fragrans Houtt. ~ Myristicaceae. SOURCE: KÖHLER'S MEDIZINAL-PFLANZEN in Naturgetreuen Abbildungen Mit Kurz Erläuterndem Texte. ATLAS. PUBLISHER: Franz Eugen Köhler, Gera-Untermhaus, Germany. DATE OF PUBLICATION: 1887 (1883 ~ 1914). SCOPE AND PURPOSE OF PUBLICATION: This publication pertains to botanical study of plants having medical interest. HISTORY: This original Gera-Untermhaus : F. E. Köhler print (above) was published in Germany in the 1887 text Medizinal Pflanzen which featured nearly 300 finally detailed illustrations expertly drawn by artists L. Mueller and C. F. Schmidt, and then executed in chromolithography by K. Gunther. Chromolithography renders images from stone or zinc plates, inking each plate using different colors which yields the multicolored print. In 1899, a second publication issued by Dr. Albert Schneider, translates Kœhler's chapter on nutmeg into English and uses color photography to produce the image based on the original chromolithograph rendered by K. Gunther. A third printing, also using color photography, was copyrighted in 1900 by A.W. Mumford, Chicago, for the John James Audubon text Nature Neighbors that was "Limited to Two Thousand and Fifty Sets."